Experience a range of breathtaking views, from Rocky Mountain peaks to delicate alpine plants and ancient wind-sculpted bristlecone pines. In cooperation with the U.S. Forest Service. Mount Goliath is a peak high on the shoulders of Mount Evans located outside of Idaho Springs within the Arapaho National Forest. Here in this fragile alpine environment Denver Botanic Gardens oversees the highest cultivated garden in the U.S., managed in conjunction with the U.S. Forest Service. Visitors can enjoy the garden, the Dos Chappell Nature Center and/or hike the M. Walter Pesman Trail. 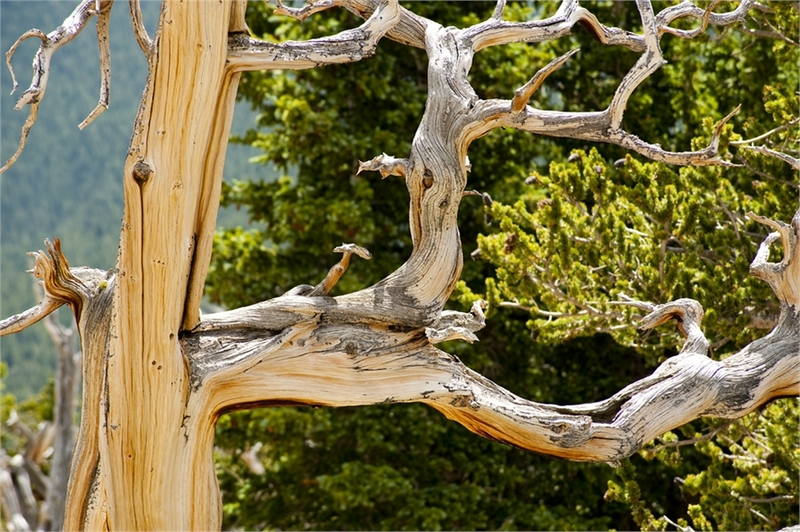 Amid grand mountain vistas, the 1.5 mile (one way) Pesman Trail winds through subalpine and alpine areas of bristlecone pines and wildflowers. The road to Mount Goliath and Mount Evans is currently closed for the season. Access to Mount Goliath is weather dependent; before visiting, please contact the Clear Creek Ranger District to find out if the road to Mount Evans is open. All visitors to Mount Goliath and Mount Evans must pay the USFS recreation amenity fee at the fee station. 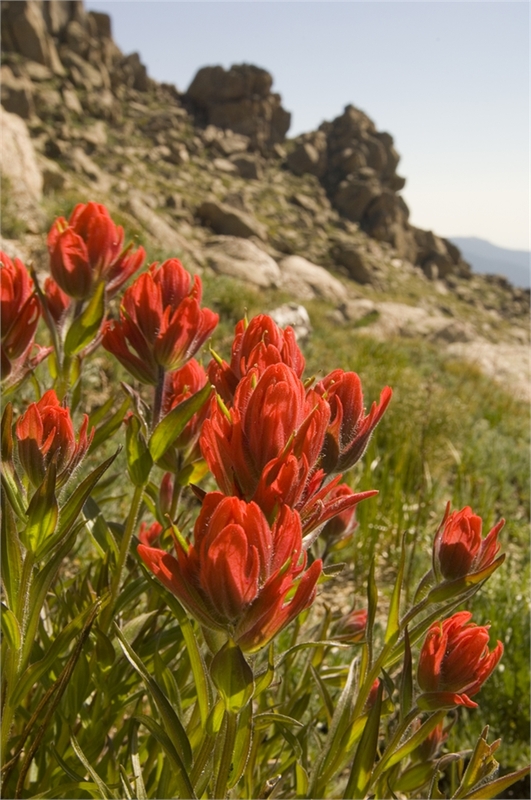 Tuesdays, Thursdays and Saturdays, 10 a.m. – 1 p.m.
Denver Botanic Gardens docents are present to answer your questions about wildflowers and the Mount Goliath and Mount Evans area. Tuesdays and Thursdays, 10 a.m. – 1 p.m.
A free shuttle runs on regular intervals between the top of Mount Goliath’s Pesman Trail and the Dos Chappell Nature Center to allow for a one-way hike down (or up) the 1.5-mile trail. On shuttle days, look for our knowledgeable docents out along the trail sharing stories about wildflowers, ecology and more. The trail is steep and rocky and the elevation ranges from 11,540 to 12,100 ft.
Due to the mountain’s altitude and exposure, the weather is more extreme than Idaho Springs and can change rapidly. Be prepared for strong sun, cold, wind or rain. It is important to stay on the trail and avoid stepping on plants. 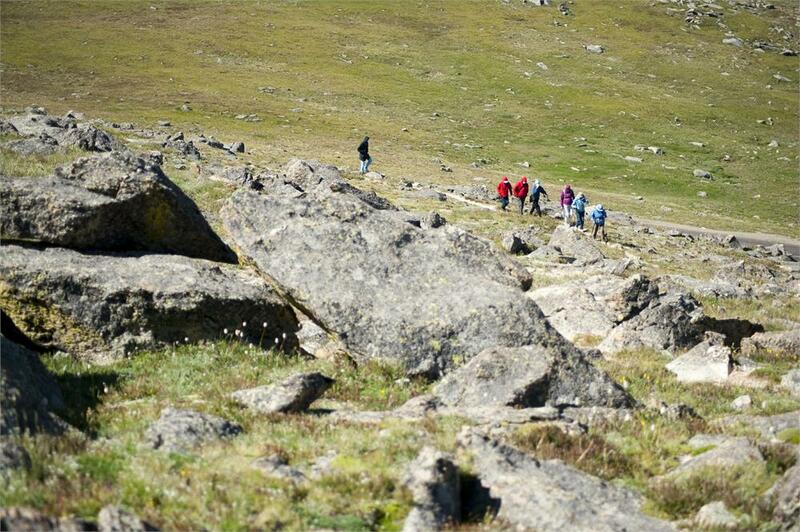 Leave no trace: take only pictures, leave only footprints. No bathroom facilities are available on the trail. The only restrooms are at the Dos Chappell Nature Center.